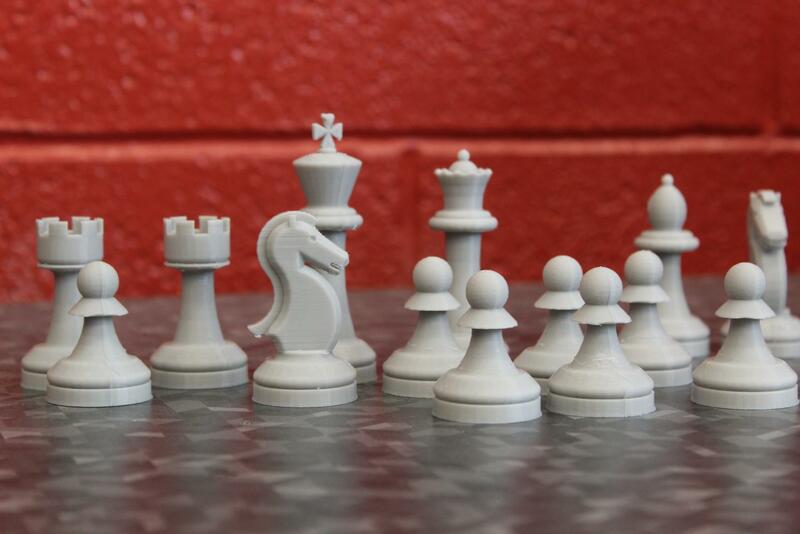 Students in Intro to Engineering and Design create 3D printed chess sets. Katrin Hustedde, art teacher, worked very closely with Patterson throughout the process of purchasing the printers. They took inspiration from a similar set up at the University of Wisconsin-Milwaukee. “Mr. Patterson and I visited the fabrication lab at UWM’s Peck School of the Arts and learned how to set up a similar environment at a smaller scale here at Homestead to help enhance both of our programs,” Hustedde said. Patterson and Hustedde decided to purchase six printers in total: one for the digital arts program which is located in room 206, and five for the STEM lab. The first was funded through a grant awarded to Hustedde for her art programs, the second through building funds, and the final four from a Parent Teacher Student Organization grant. 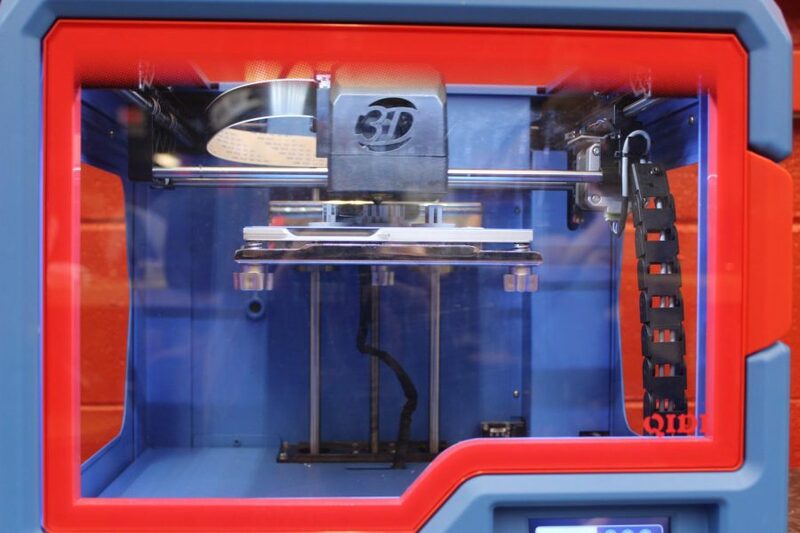 The printers are available to all students enrolled in Intro to Engineering and Design, Digital Art and/or AP Art courses; however, others have been able to access them. “We welcome all students to use our printers for smaller projects but our students have the main access,” Patterson said. Throughout the past two trimesters, both Patterson and Hustedde have successfully incorporated the printers into their curriculum. In Patterson’s Intro to Engineering and Design classes, students begin by 3D printing small Lego pieces with the goal of having them fit together with a real Lego. Students also design and print their own chess set among other projects. “My favorite project was when we first used the 3D printers to create an object that fit a Lego piece because it was my first time ever using a 3D printer, and it was interesting to see all the ‘behind the scenes’ work that goes into one printing,” Annie Gebhardt, junior, said. Caroline Ferrero, senior Digital Art 2 student, has been able to apply the skills gained from Hustedde’s class to her future. Ferrero received the MIAD Dean Recognition Scholarship, which is awarded to freshman in recognition of outstanding academic achievement and visual arts talent. Ferrero also plans to focus heavily on digital art in the future. “I owe a lot to Ms. Hustedde and Ms. Connelly… I want to major in Illustration, and Communication Design and minor in Animation which will all require the digital art skills that I learned at Homestead,” Ferrero said. Along with promoting future career paths, Patterson hopes this technology will help his students have a greater appreciation for their work. “The biggest goal that I have is for students to have that feeling of success when a project goes from an idea to a model and then to a physical piece. We talk about designing different things with students and it’s really cool to see it go from start to finish,” Patterson said. Looking towards the future, both teachers are excited for what is to come, and Hustedde has even written a grant for a new ceramic 3D printer which will arrive this spring. “I can’t wait to see where the technology heads next. Schools everywhere are just starting to embrace this new way to create. It’s exciting to be on the forefront,” Hustedde said. The 3D printer prints a chess piece for Intro to Engineering and Design.